Mini skid steer loaders manoeuvre easily and contain industry leading safety features. They display breakout force and lift capacity more commonly associated with larger skid steer loaders. All our loaders are provided on trailers to make transport easier and they can subsequently be towed behind most everyday vehicles. The compact size of our mini skid steer gives them an advantage over most others in their class. Whether it’s on a commercial worksite or home project, tour skid steers can manoeuvre in and out of tight spaces with ease. 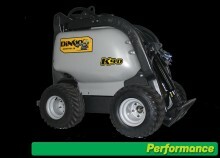 They feature up to 500 lb (226.8 kg) SAE-rated operating capacity and a tipping capacity up to 1430 lb (648.6 kg). Also a hi-low flow selector and a conveniently placed auxiliary lever, operators can tackle a variety of tasks with ease. We offer both track-driven and tyre units, with spring-cushioned operator platform for added safety and comfort. Versatile and equipped with a nearly 6’ (1.8 m) dump height, these mini skid steerssaves labour and time.